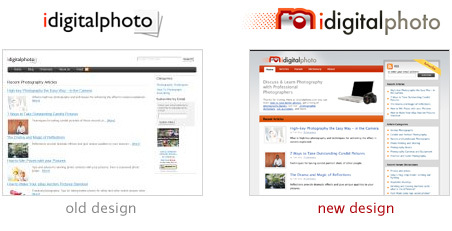 A few weeks ago we quietly relaunched idigitalphoto.com with a new logo and design. We’ve tried to make the site easier to navigate and improve its usability. If you have any feedback on the new design, we’d love to hear it. In case you haven’t yet done so, you might also want to check out the revamped photography dictionary – we’re working on expanding some of the thousands of definitions you can find there. If you find a term that you think can be explained more clearly – we’re open to your contributions in helping to build the most comprehensive photo dictionary online. Thank you for visiting and reading idigitalphoto. We appreciate all our readers. Nice site you and articles you have here. I love what i see here keep it up. The new design is okay and was easy to navigate. Again well done on the good job. Thanks for this site anyway though! I bought one of your books and love it. We got rid of the forum because we didn’t have enough time to properly maintain it and it became overrun with spam. We’ll concentrate on putting out quality articles instead.